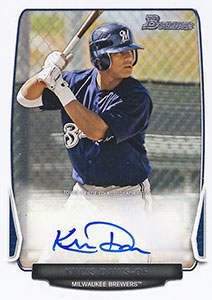 Khris Davis was born on Monday, December 21, 1987, in Lakewood, California. Davis was 25 years old when he broke into the big leagues on April 1, 2013, with the Milwaukee Brewers. His biographical data, year-by-year hitting stats, fielding stats, pitching stats (where applicable), career totals, uniform numbers, salary data and miscellaneous items-of-interest are presented by Baseball Almanac on this comprehensive Khris Davis baseball stats page. Khristopher Adrian Davis is an active Major League Baseball player who played for the Milwaukee Brewers (2013-2015) and Oakland Athletics (2016-today).